I can't tell you how many times rhat I see someone without a life jacket on when I am out on the water. I used to be one of them, but since I have found the right PFD you won't find me on the water without one anymore. The reason you see most paddlers not wearing one is because they are not normally comfortable when you paddle and they get in the way when you are trying to cast and it can affect your fishing performance. I found that Onyx made some vests that are intended to be worn by paddlers. The design of the PFD makes it easy to paddle as well as cast. It also comes with enough pockets on the front that you are able to store some of the items that you are using frequently. If you are going to be fishing from a boat they also make a line of inflateable PFD's that have a unique vest design that makes it more comfortable to wear during the day. A review is only as good as the words that are written. 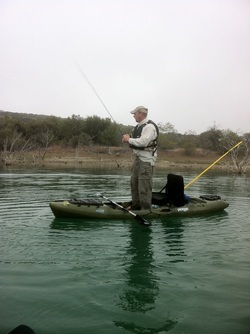 I will follow up with I was able to test out my Onyx PFD on the Guadalupe river a week ago when I was in an eddy ;ooking at the bottom in the clear water and the nose of my kayak went into the fast flow which sent my kayak spinning so fast that I lost my balance and over I went. I was able to regain my composure and swim around gathering all of my gear and felt completely safe doing so. I would highly reccomend that if you are looking for a very good life jacket then go to the Onyx website here in my links and check them out. What a lot of people don't know is. Not only do Rod Glove's keep your rods from getting tangled with each other in the rod locker of a boat, they are just as great for the kayak fisherman. Due to the high visibility of the covers when in your rod holders, you are now able to be seen a lot better by boaters while you are on the water. I have had boaters stop and tell me that the Rod Glove was the first thing that caught their eye, otherwise they might not have seen me in time to avoid me. I have also had to pull a rod with a Rod Glove on it out of the holder and wave it to get the attention of the driver of a boat who for whatever reason did not see me and was heading strait for me at a high rate of speed. Again, the key thing here is I was noticed. Another great feature for the kayak fisherman is that they will help keep your rods from getting pulled out of the rod holder if you get into some trees, thus saving you the expense of having to replace a rod and reel. So think about the investment that you make in your gear and try these out, they are worth every penny. 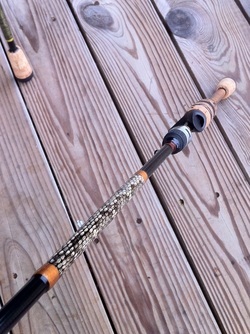 If you are tired of fishing with ordinary off the shelf rods then you definately need to check into a custom rod. What I have found is they are much stronger as well as being a lot lighter. The micro guides give me the ability to cast further and smoother as well as the rod being very sensitive I can feel the contour of what I am fishing and the suttle bite of a non agressive fish. I would highly reccomend this to anyone. There are many kayaks out on the market and all claim to do different things. The hardest thing about choosing one is getting the one that fits all of your fishing needs. Now I have owned many brands, Cobra, Native U12, Wilderness Ride and Four different Malibu's. 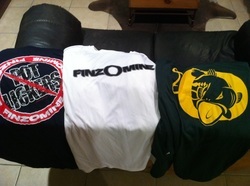 They were all good respected brands but none of them were designed with the fisherman in mind. The JK Coosa came along with the intent of luring fisherman by offering a kayak that is not only designed for fishermen but it was designed by a fisherman. The other brands would slap some rod holders on and call them a fisherman package but that was about it. The Coosa is basically a fishing platform, you can sit elevated in the high position seat and be comfortable all day as well as being at a better advantage for seeing what's in front of you. If you are doing a lot of paddlin then you simply lower the seat and get after it, simple. Now I have never been one to stand in a kayak, that is another great design element is you are able to stand and sight cast as well as stand and paddle if you desire. Look at me in the picture. I am 250# and stood and paddled with no problem once I found my balance as well as developed trust in the kayak and myself. Will I do it all of the time, no. But if I want to I am able to. Another thing that I value in a kayak is storage. When camping out of it on a river fishing trip I need to have as much stuff under deck as possible. I was able to put more gear under the deck in the Coosa than I ever was in the other kayaks that I had owned. I also stayed dry in the kayak instead of sitting in water due to the weight. Their are also two rear slanted rod holders that allow your rods to ride in a swept back position instead of straight up, a much better design than others. The front and rear hatches have raised lids that keep water out as well as being able to lock them if you have gear stored inside and you need to run into a store you can lock them and have a little better piece of mind. There is a notch on both sides of the top of the deck where you would normally place your paddle when casting that aids in keeping your paddle in place, even on a windy day. There are many other features that can be found by going to the Jackson Kayak website. 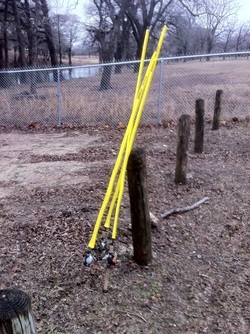 If you are a fisherman then this is another great tool. The first thing that I noticed upon opening up a pack of JD's frog's was the feel of the plastic. 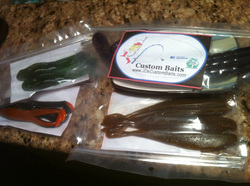 These are hand poured and you can definately tell the difference between these and machine made baits. I was fishing the river over the weekend and had the chance to try them out over some patches of grass that were about a foot under the water and the bass were using it to spawn in. The water was clear so I was able to see most strikes as they occured and I think that was where the problem lies. I missed a few fish due to the reflex reaction of the strike. I knew it was coming but got excited and pulled it out of the fish's mouth many times before they could really get ahold of the frog. It did a great job of getting the attention of the bass and some would even cover some distance to get to it because of the attractant. I will be going out again soon and will definately be tossing them again. How many times do you find yourself grabbing for your paddle after making a cast to try and correct your position so you can make that perfect presentation to the fish that wait below. I know that it has been done a few hundred times just on one trip, but there is a product out there by Backwater Paddle Company that can make things easier for you. The Piranah hand paddle that they make is not only easy to use but it is very quiet when you are trying to correct your position. I have used it on three trips now and it did take some getting use to but not by any fault of design but trying to remember to quit reaching for your paddle. Now I just lay the paddle down and use the Piranah to move around and position my kayak. The hand paddle comes with a strap and the paddle will also float if you accidentally drop it into the water. It sure has made my kayak positioning so much easier now that i’m using it. The price is right for such a great add on to the gear that you already have. I now have two of them which are kept on either side of me for easy access. 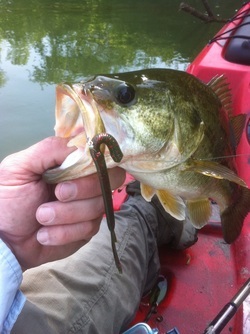 I was able to use the Dinero worm from Get Five Lures over the weekend and with great success. The two colors that I focused on were Watermelon Red and Green Pumpkin which I fished Texas rigged with a 1/8oz bullet weight and a 2/0 worm hook. Being a soft plastics fisherman most of the time, I am usually throwing a french fry because of it's size and it is normally something that the bass don't see all of the time. The Dinero with it's combination of unique action and scent had no problem attracting the bass and I was able to land over 35 bass in two days of fishing while going through a pack and a half of these custom poured plastics. The Dinero now has a permanent spot in my plastics bag and will get fished more frequently. Get some or GET FIVE. As I get older I think about things that should have been done when I was younger and one of them that I didn't do a good job on was skin protection. Since the kayak is at the waters edge it is even more important to protect yourself from the harmful rays that are being put out by the sun and the newest thing that i've found is the Performance Sports Apparel being produced by FINZOMINE, a local company in Texas that not only protects you from the sun but the shirts are breathable to keep you cooler and they dry out extremely fast when you get it wet. Their designs are catered around fishermen and the product line keeps growing. Take a look at their website and give them a try.